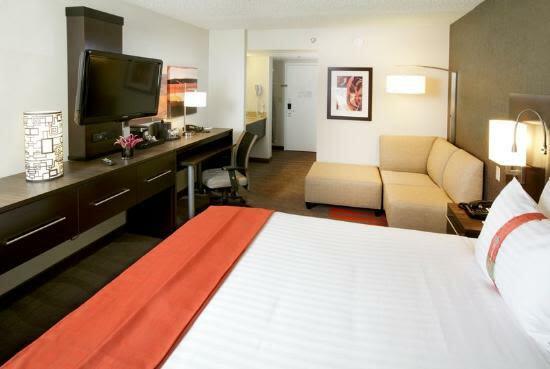 Whether you are traveling for business or leisure, the Holiday Inn Newark Airport has the accommodations you desire. Located across from the main entrance of Newark Liberty International Airport, they offer convenient 24-hour complimentary shuttle to and from the airport. To ensure that you won't miss your flight, they have a flight information center right in our lobby to check your flight status and prepare your boarding pass. Enjoy meals and beverages at The 450 Bistro & Lounge. Recharge with a workout in our state of the art fitness center. They also offer a complete business center and free wireless Internet. Their state of the art meeting facilities can accommodate up to 40 people. For those driving, they are convenient to both I-95/New Jersey Turnpike and I-78 and only 15 minutes from downtown Newark, 20 minutes from the Statue of Liberty Park, and 20 minutes from the Meadowlands Sports Complex and 25 minutes from New York City. Their professional, customer-friendly staff looks forward to your stay at the Holiday Inn Newark Airport.